Okay. Now that you remember how to do everything, we’re going to address what to do with those 4 threads left in the middle of your cut spaces. The easiest way to finish them is to wrap them. It’s exactly how it sounds – you will wrap the perle cotton around the fabric threads. You will want to use one size smaller thread for wrapping than you did for Klosters (i.e., if you used size 5 for your Klosters, use size 8 for your wrapping and “fancy” stitches) – that will give you the look of lace. Start on the underside of your fabric. Decide which bar you want to wrap, identify the closest Kloster, and on the underside, pass your needle under a couple of satin stitches on the far side from your bar (see picture). Hold the end with your thumb, and wrap the thread around the last stitch, then pass back under the last stitch and the next one. Repeat a couple of times to secure your thread. Turn the fabric to the right side to begin wrapping. To wrap your bars, you must maintain even tension. If your tension is too loose, there will be gaps between the passes and you’ll be able to see the fabric threads and it won’t be pretty. If your tension is too tight, it will “shrink” your bar and put tension on the rest of the piece. Begin wrapping which ever direction you choose. I like to work from right to left, passing the needle from bottom to top on the front of the fabric threads. 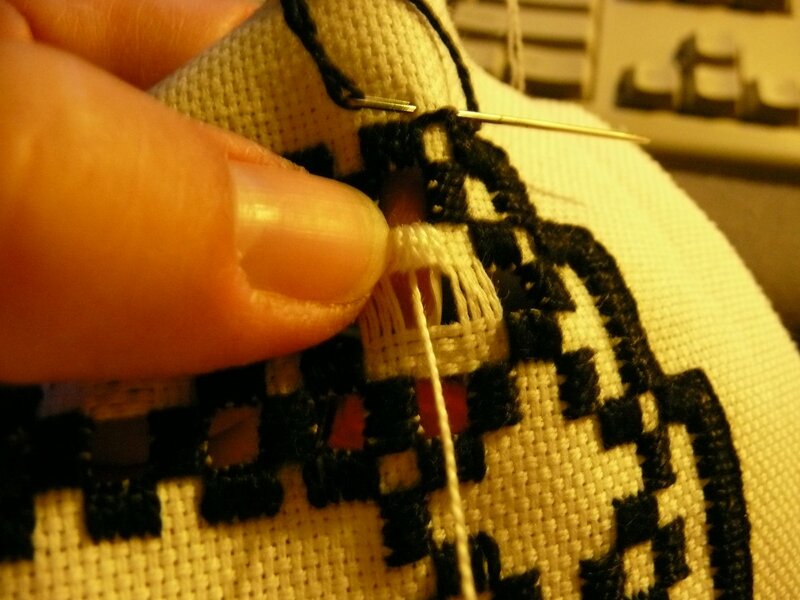 I use my non-dominant thumb (my left) to hold the wrapping stitches in place and snug them together (see picture). When you finish one bar, move on to the next side of the square by turning your fabric. Be sure that you start your new bar by passing the needle from the underside of the first bar to the underside of the second. 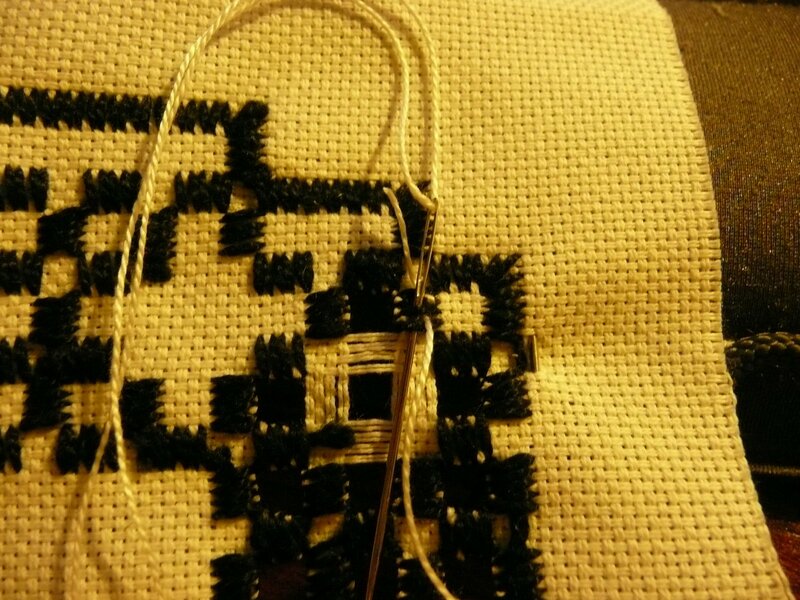 It’s a good idea to work in a “grid” – finish one whole square before moving on. When we get to weaving and web work, you’ll see why. As always, if you have any questions, please post them here. This sounds a little confusing as I read it, but I’m not sure how else to explain it. This really is a simple procedure, and if you try it as you read it, it should all make sense.